Thirteen years at stud. 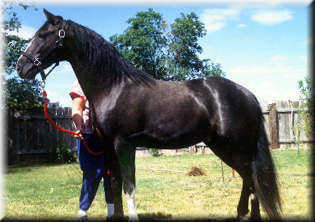 He is a proven sire and grandsire. 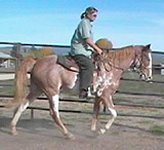 Chief’s offspring have been well gaited and very athletic. They have excellent conformation with wide chests, short backs, and good bone. Chief’s foals are very gentle and easy to train with wonderful temperaments. Non-Refundable Booking Fee*: $100. Live Foal Guarantee. Negative uterine culture, Coggins Required. We have several excellent Equine Veterinarians close by with Ultrasound Services available. Conveniently located 2 miles off I-94 , exit 87 , Forsyth , MT . GLL’s Sun Chief proudly announces his Grand Foals! Shadow is proudly owned by Sue Best of Warner Springs, California. Roy Dolbear, Colstrip, MT has a 1/2 walker son, Traveler; he’s taken him on his first hunting trip into the mountains where he performed exceptionally well. He said Traveler has been so personable and easy to train and handle. 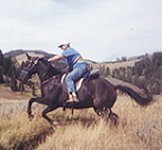 Ann Cantrell, Shepherd, MT has a black, blaze faced daughter, Angel; she said this mare was so gentle that after her ground work all she had to do was get on and ride off. Ann said Angel is very agile and fast on her feet.